We need to chat about something that I’ve noticed recently. Homeschool moms can be really mean to each other. 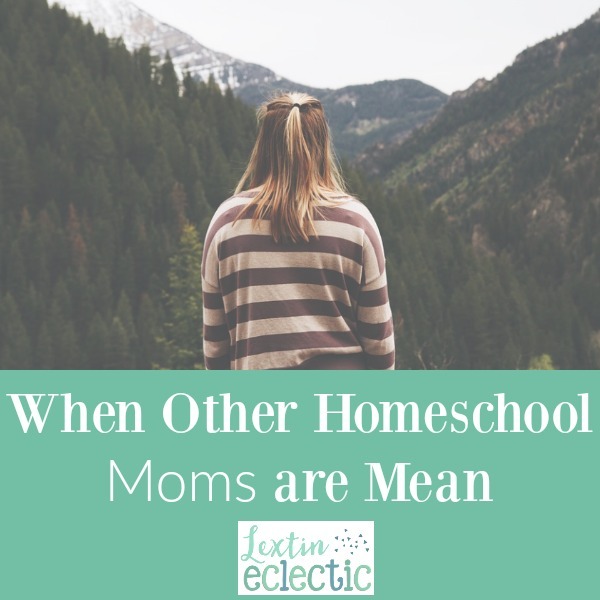 Just when you thought you left all that high school drama behind you…welcome to the world of homeschool mean moms. Have you encountered one of them? Some moms want to compare their curriculum to yours. They want to find ways that their curriculum is superior and more rigorous than yours. Other homeschool moms think their homeschool style is better than yours. They have found the “right way” to homeschool and it’s definitely the best. Sometimes homeschool moms are so involved in their co-op group that it becomes cliquish. They aren’t willing to make friends outside of their co-op group and you’re left feeling like an outsider if you’re in a different co-op or even if you’re crazy enough to belong to no co-op at all. Homeschool moms are sometimes subtly critical of your homeschool style while others might be openly critical of some of your choices. Now, not all moms compare their homeschool to yours aloud. Most of the time the criticisms are only in their head – yes, they are silently judging you. Sadly, I’ve fallen into this trap and silently compared myself to other homeschoolers. Whenever I felt like I was coming up short, I would look for something negative about their curriculum, their homeschool style, or their routine. I listened to them talk about their homeschool and then I sat back and quietly judged their choices. Homeschool moms, this isn’t ok. This is so hurtful and it only weakens the homeschool community. We should stick together, build each other up, and encourage others in their homeschool journey. Why do we think these things? I believe these thoughts are rooted in insecurity. As homeschool moms we often worry that we are failing, our curriculum is not the best, our style is inadequate. We worry that we are not enough. Those insecurities cause us to judge the other homeschool moms we meet. I’m here to tell you that you’re not failing. Your curriculum is the best choice for your family. Your homeschool style is perfect for you. You are enough – for your homeschool, for your family, for your kids, for this job of homeschooling. Whenever you’re tempted to say or think something negative about another homeschool mom, take a deep breath and say something positive instead. Find several encouraging things that you can say to another homeschool mom. Remind yourself that judging others is a product of your own insecurity. Chances are that she suffers from her own homeschool insecurities. She has her own struggles and fears. Let’s end the homeschool insecurity. How much better would we be as homeschool moms if we looked for the positive aspects of each others homeschools and pointed them out? I’m not a homeschooler myself, but my friend is and I’ve heard from her just how clique-ish the other moms can be. I don’t understand why moms can’t just support one another, plain and simple?! I know! I was so discouraged to find that homeschool moms can form cliques and be really rude to one another. After experiencing it more than once, I felt compelled to write about it. I hope that we can all learn to be more supportive and encouraging to one another. You are so right! We need to support one another and find ways to be encouraging! I homeschooled a couple years ago until we moved (and just couldn’t handle the stress of it), and you just put into words something that I felt, but never had the clarity to give words to. I definitely felt insecure, and in that I tried to find approval of other homeschool moms. Which I did not get obviously. In the end, I did what worked for us, but always felt the pull to do more, or felt like I needed to be better at it. I’m sure I will one day go back to homeschooling, and the next time I will be more confident. Yes, I think we all battle some form of insecurity. I wish we could just be more gracious and compassionate to one another. And yes, homeschooling is very very hard (as is parenting) so it’s very important to be encouraging to each other. I think this happens with ALL people, for many situations. Naturally ‘mean’ people will find a way to criticize and bring in that high school drama, whether it’s a homeschool mom or a PTA mom. *sigh* It gets so tiring, doesn’t it? I admire homeschoolers, it’s such hard, hard work! This is true! It’s sad when people feel the need to tear others down. The truth is we as mothers need to be more supportive in all aspects of parenting! I never thought of homeschooling moms being judgemental like this, but I can imagine it would be difficult! If your homeschooling, you need all the support you can get! I was really surprised when I learned that homeschool moms can be very judgemental. It was so upsetting the first time one of them made a really rude comment to me. I wish we could support each other in our homeschool journey! Homeschooling is hard and we need each other! I’ma new homeschool mom and I haven’t experienced anything like this yet. Well maybe I shouldn’t say yet, as I hope to not experience anything like this. I’m pretty laid back so hopefully this will keep me off the comparison train lol. Yes, the comparison thing can be such a challenge. It can make you feel really discouraged in your homeschool journey. And I’ve found that a lot of other homeschool moms like to try to compare themselves to you so it’s really hard to avoid this discussion! When I first started and had questions I tried to ask other Homeschool Moms and they wasn’t very helpful and some were rude and just walked away. It almost made me quite. So I Pray I never treat someone like this. It’s so frustrating when other moms can’t encourage and support us. I have met homeschool moms who just want to compare their homeschool to mine. It’s so discouraging! newbies in the group. I really don’t know what to make of it, they pretend to be very holy and good in church, but outside of it our some of the meanest unholy bunch of b**** you will every meet. I don’t want to be involved with their group anymore or the church anymore, but not sure where to go from here. It is hard to fit into a homeschool group, there seems to be a lot of competition, no support, and drama. I would like to start my own homeschool group, but I don’t know many people that homeschool and not sure how to start one. I want a group where we respect each other, support each other, and treat each other as Christ said, ” To love one another as you would love yourself.” I want a group were we can make lastly friendships, and not compete or talk about each other behind each other’s backs. I know one is perfect we fail at a long of things, but as Christians Christ convicts us of our sins and when we are not acting according to His Word and treating others less than dirt shouldn’t you think that people who truly knows Christ would say, I was wrong and I’m sorry for my behavior, no they still continue to live a lie thinking their actions are justifiable. I’m so sorry you’ve had to deal with that. I do think it’s very sad how homeschool moms are mean to each other. We all homeschool differently (and even for different reasons), but we can be kind, gracious, and supportive to each other. That’s how it should be! An honest and brave post. Thank you. There is a lot of self congratulation among homeschooling moms. It’s only natural with those going against convention. What makes it difficult to take is that home schooling moms often present themselves as more accepting and supportive than other moms. Nope. They’re people just like the cliquey PTA moms. Not better or worse. I know this is a very old post but I’m a proud public school mom who has been bullied relentlessly by homeschool moms at my church. My husband & I feel strongly called to be apart of our public school. We volunteer, coach, and help with after school church club for our local school. We started on the public school journey 10 years ago. I’d never do anything different, but I’ve lost all of my church friends to their homeschool group friends. Homeschooling is literally the thing that keeps them friends, and keeps me on the outs. To be honest, it’s hard to not feel contempt toward homeschool families. The arrogance I’ve seen is hard to swallow. I’m sorry you’ve been isolated by homeschool moms. I’ve found that moms in general can be very mean to one another – judging each other for personal choices. I am very sick of this attitude that is so pervasive among moms. As Christian parents we should support each other, pray for one another, and be the body of Christ to each other and to other families in our community. I am so sad that this is so divisive. Know that I have experience a lot of judging and cliquish behavior even as a homeschool mom. Know that if we met in real life, we could most definitely be friends as I have mom friends of all walks of life and I love being able to support and encourage them.